Fast changing market conditions, growing competition and increasing customer demands force companies to constantly optimise their processes with regard to transparency, flexibility and speed. In order to achieve this they must use modern digital technologies to further network their business processes. This is true for both the internal processes and the complete supply chain from the supplier to the customer. 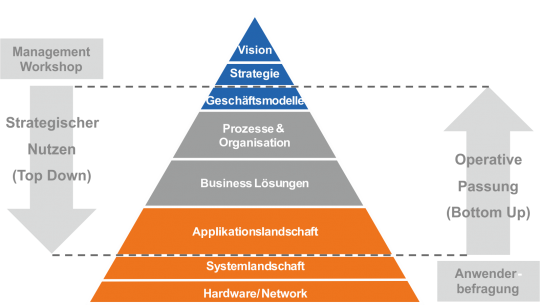 An individual stratety – an IT-Roadmap – is needed to keep track of the more and more complex network of processes and IT and to lend the guidelines for the sustainable planning and further development of processes and IT. Which processes are running fine? Which can be improved? To what degree does the used software support daily tasks? Where should the company be in the mid-term and the long-term? Which market should be opened up? Which software investments are useful? When is the right time for which project? Trovarit uses a well-founded methodology and powerful tools to create a reliable basis for the safe and efficient further development of the software infrastructure. What influence do the business processes and functions have on the success of the company? How mature are the company processes with regard to stability and contollability? To what degree and how good does the existing software infrastructure support the execution of the business processes? Starting from the answers to there questions, the optimisation potentials and the fields of action are determined, consolidated and prioritised. Possible approaches to tackle the more relevant fields of action are developed and roughly assessed with regard to costs, benefits and bi-directional dependencies. The result is a chronological and topical roadmap which includes all measures for the mid-term and long-term development of the business software infrastructure.under consideration of the existing software landscape. These measures can cover, e.g. prepare and hold "validation / perspective workshop"